All we sad before about aero and mechanical setup is important, but is always the track that dictate setup of the car. 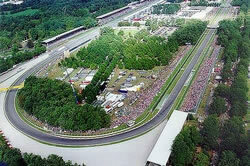 Setup is quite different if we are talking about low downforce track (Monza) or high downforce track (Hungaroring or Monaco), track with predominately fast corners (Turkey) or slow corners (Hungaroring), flowing track (Silverstone) or start - stop kind of track (Canada). I will not go so deep in this type of setup because I will need a book to explain all, but here is explanation of few different types of corners and how to do your work there. A constant radius corner is one that has a quick gentle turn-in, a long consistent apex, and a gentle exit. 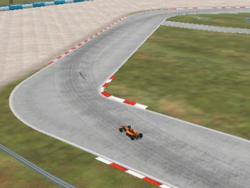 Providing the track is fairly level, setup for the corner can be tackled in a fairly routine way. As in all corners, how vital it is towards the overall lap time and how many corners like this are on the circuit should be analyzed before determining how much the corner should effect the car setup. A constant radius corner is actually quite simple. Providing you've roughed in your spring settings for fairly neutral handling, then this is all about aerodynamic downforce and anti-roll bars. The transition for turn-in to steady state cornering is fast. The car is on the bars quick and stays there for quite awhile. Typically, a well balanced car will automatically have reliable handling through most constant radius corners and one can determine quite quickly if a change in downforce will help. For this reason, this type of corners are good corners to focus on early in the initial setup of the car adjustments including springs and anti-roll bars. If one is experiencing trouble being competitive, and the corner is high speed, then front wing adjustments would be first on the list, with anti-roll bars and weight distribution a close second. If the corner is medium speed, that order might change. Also, any adjustments to the dampers should be performed with thought towards what compromises in other corners may occur, particularly if the circuit has one or more decreasing radius corners elsewhere. weight transfer. Here you'll want to run softer slow damper settings. While softening the rear, be aware of the packers vs. ride height. For the car to hit the packers (especially the outside rear) is counterproductive as it will instantly overload the tire with weight. Typically, the anti-roll bars and aerodynamics are not good things to adjust specifically for this type of corner, unless you're experiencing imbalances elsewhere. car be able to brake deep and turn in simultaneously. A well-honed trail-braking technique will defiantly aid in making the pass here. The basic setup principles for this type of corner are such that you want the car to have good turning, but more importantly, a stable rear. Because the transition from turn-in to steady state cornering is so long anti-roll bars are less critical. Softening the rear springs, helping the rears not to unload as much weight, is a great starting point if you're having trouble being competitive here (and providing this is a critical point on the circuit). But most importantly, dampers are the keys to unlock the cars maximum potential under braking and turn-in. One must control weight transfer. More specifically, the rear dampers' in slow rebound. Soften them to help maintain weight at the rear for as long as possible to help traction. An alternative might be to go to the front and increase the front damper slow bump values. Differential lock values can help here as well. You're already turning when you have to get off the throttle, so you really want that torque under control. But be careful of oversteer while reapplying the power. As stated earlier, the differential lock setting is very dependent on personal driving style. A fast esse is typically a combination of two or more corners. At these speeds, aerodynamic balance is a key factor. But probably equally important is the correct driving line which allows the fastest cumulative sector time. Missing the best line during this phase by just a meter can cost massive time loss as it disrupts the flow for the next phase, or worse yet, the entire following corner. For this reason, front end steering response is crucial. One also must have faith in setup as the speeds traveled here repay mistakes with big spins. Like mentioned above, aerodynamics has a big influence through these types of corners. After setting gear ratios and a rear wing angle based on the circuits' top speed, the front wing angle can be adjusted to balance the car. Basic spring settings can be put to the test through these high-speed direction changes. Stiff font springs give the car the much-needed quick steering response. Too high a spring rate will adversely affect the desired level of grip though and must be countered by additional front wing or a softer anti-roll bar. Special attention should be paid to the tire temperatures as overheating can occur from these changes. Softer rear springs enable the rear tires to bite and keep the power transmitting to the track. Use the damper slow settings to control weight loading and unloading into the tires during changes of directions. Also, this is a big anti-roll bar fine-tuning section as the car is changing directions and loading the bars in both directions in fast succession. Once the anti-roll bar settings are roughed in here, they should require only minor adjustments for other sections around the circuit. The exception would be when adjusting the anti-roll bars to compensate for another adjustment such as mentioned above. Differential lock settings can prove useful here, especially if one is using engine braking by coming off the throttle to slow the car to setup the following corner. can start to fine-tune the springs and dampers. The latter probably more so. You'll want to focus on sharp turn-in characteristics with front springs, dampers and anti-roll bar adjustments. Go as stiff as possible with the front spring settings without upsetting the overall balance of the car. Try to balance out any induced understeer by increasing front wing angle or choose a smaller front anti-roll bar until a more neutral balance is obtained. Be careful though as these types of adjustments can quickly result in above optimum tire temperatures by overloading the front tires with weight. Also a more aggressive driver might use the kerbs here, so damper fast settings become a factor as well. Damper fast settings aid in the cars ability to react to bumps, so if loosing grip while riding kerbs you might try lowering the fast bump settings. Chicanes are essentially slow esses, so all of the medium esse characteristics apply here. Also, because the phases happen in rapid succession (due to the overall smaller size of the chicane features), car imbalances tend to be magnified at the point of weight shift during the change in direction. Also, the overall slower speeds mean aerodynamics is less or no factor in car balance and mechanical grip has a great deal of influence. Doe to the tight nature of most chicanes, riding over kerbs is an acceptable risk. 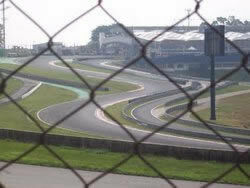 Many times, a chicane will denote the slowest corner on a particular circuit. This means it is many times preceded by a heavy braking zone, making it a great point to fine-tuning the braking bias. As this makes the chicane a prime overtaking location, focus should be given to car setup through the preceding corner as to allow the most efficient exit. 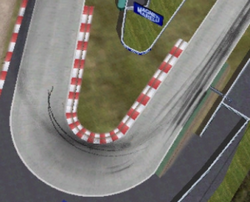 This will, in turn give the car maximum speed on the following straight leading to the chicane, making overtaking that much easier. This also means this is the corner to help select your lowest racing gear. Quite often is the case that second gear is the lowest selected gear once the race has gotten under way. If this is the case, second gear becomes the lowest racing gear. In this case, the second gear can be adjusted to allow the best possible acceleration while maintaining stability when exiting the chicane. Otherwise, first gear should be a compromise of chicane exit stability and standing start efficiency. 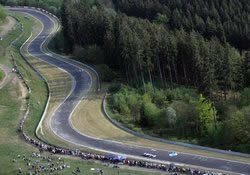 Hairpin corners stress the cars braking capabilities to their maximum. Typically, the car is being coaxed into slowing from top speed down to anywhere from 50kmh to 100kmh. Sharp front-end grip is essential to allow a driver for be competitive here, particularly when passing. The turn-in comes early and the short apex is at the middle of the inside kerb. While qualifying the line will vary. The braking will be kept to as late as possible (allowing the car to travel at top speed a few hundredths on a second longer), followed by a late turn-in. 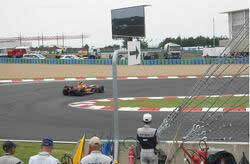 This will shift the apex back later in the turn (on the picture above, the skid marks represent a good fast line). By moving the apex later, the radius of the exit is lessened, allowing power to be applied sooner and more importantly, at a more aggressive rate. Like chicanes, hairpins are great places to set the braking bias during early training session laps because the most aggressive braking zones on the circuit typically precede them. Typically teams don't concern themselves with tuning a car around a hairpin beyond the basic roughing-in of the chassis balance (wings, springs, anti-roll bars, and ride height). 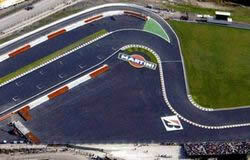 Focus is on other medium and high-speed corners, the hairpin tends to fall into place. But here gear ratio is very important. It tends to dictate lowest racing gear and therefore the gear should be chosen to allow the most stable acceleration out of the hairpin possible. The hairpin is also a prime passing zone for most circuits. This makes the prior corner extremely critical as far as the setup is concerned. Remember, overtaking that happens here was really executed through the previous corner, allowing the car to gain an advantage over a rival heading into this turn. Double Apex corner: Sepang Circuit, Malaysia "Turns 7 & 8"
From time to time, two or more successive corners will line up in such a way that it enables a driver to attack them both as a single corner. This means the first corners' exit and the second corners entry become essentially both same corner, or the overall corner apex. In this instance, the Corner Apex phase is rather large and may contain some throttle adjustments. The car must be set to allow mid corner throttle adjustments to not effect the car in a negative way. Because of these things, these types of corners have more or less the same characteristics of the constant radius corner. Basic balance is achieved with springs and anti-roll bars, assuming aerodynamic balance has been achieved. A more stable throttle behavior can be fine-tuned by differential lock adjustments. If the double apex requires a slight throttle lift at the apex, and this in turn cases too much oversteer, then a higher differential lock setting is required. More about cornering technique you can find here, and about corners here. To have a complete picture of performance driving, take a look at Corners, Setup, Traction circle, Using tires, Left foot braking, braking, advanced braking, WRC braking technique, Slipstreaming, drifting, cornering, shifting, Heel and toe driving technique and steering technique articles.